Are you a master of the public cloud or just a digital flop? The journey into the cloud continues. In my previous blog about the topic, I touched the matter of the importance of the journey to benefiting from public cloud services and argued that most such journeys had ended in disappointment. Between these two blog posts, we held a small workshop, where we presented our opinions to the CIOs of various companies. In the CIO 2018 workshop, I claimed that the journey towards exploiting the public cloud in Finland and Nordic markets are distorted by market forces and certain megavendors with a strong local presence. This point of view is based on my interpretation on several studies according to which 85% of global use of the public cloud occurs at application level (IDC 2018, Rightscale 2017), when the corresponding figure for Finland is around 50% (BizTech 2017). This view is supported by a new term publicized by Gartner this year, "Digital Super Through", which refers to the digital flop of the years 2019 to 2020. The underlying cause of the digital flop lies in the perception that exploitation of the public cloud does not produce the promised and desired results in terms of growing a business. IT management scales, but businesses do not. Why does the application level (or SaaS at the public cloud) matter? Because the outsourcing of IT infrastructure, as such, to the public cloud only provides scalability for corporate IT management, but does not scale the business model in question. This, which is also known as ‘reactive service development’, is the simplest form of public cloud service utilization. We are still taking our first steps into the public cloud. Operational excellence can only be achieved by refining the use of the public cloud infrastructure to the ‘nth’ degree through automation, architectural expertise, an IT service management system (ITSM) and with the right partners. This means taking IaaS optimization and utilization to extremes, but the same could have been achieved in a private cloud or even in one’s own IT infrastructure. The company's service culture is very IT-oriented. The counterpart of operational excellence is business innovation. A company's orientation, business and IT management cooperation work smoothly, but either the business model, processes or partners are not quite ready for using the public cloud in business development or the management of core IT functions. When the required expertise is in place and an adequate level of process automation has been achieved, the paradigm shift can be made from commercial innovation to the proactive generation of business value. IT management’s role lies in innovating and facilitating new data-based business opportunities. Only this level represents the sustainable digital transition of the future and a genuine model for benefiting from the public cloud. Reality is often driven by compromises. Even if 50% of companies have an "all-in" strategy for benefiting from the public cloud within the next couple of years, in practice only around 40% of business data will be processed through the cloud. So it is worth letting those inflexible legacy systems wind down to end of their lifecycles, to focus on building applications in the public cloud from the cleanest possible slate. Do not, therefore, seek a better end result based on your original goal, but set wholly new goals for benefitting from the public cloud and your data. Allow, enable and encourage innovation. Appointing or recruiting a cloud architect is often the first step. When you use cloud services, your number of partners is bound to increase. So create a partner strategy, take care to choose the right strategic partners, and try to create a Service Integration and Management (SIAM) model. The role of IT management should become that of a broker for partners and services, where businesses and end users only see the data and service layer. 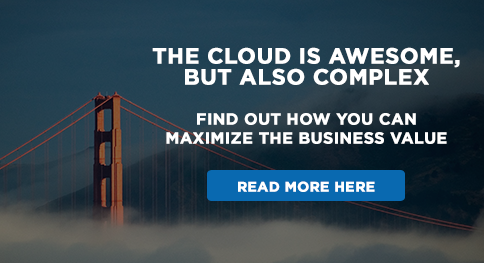 To benefit from the public cloud, you will need a completely different management model. Explore the Bi-Modal management model and remember that a agile (Mode-2) management model is needed in order to manage the public cloud. You will not succeed with traditional models. While 85% of the respondents in our workshop had only reached the reactive level of benefiting from the public cloud, their transition into the cloud was already underway. Achieving business scalability requires a transformation in management models and processes, which is always an executive decision and has at least some impact on every process and beneficiary of processes within an organization.